Referendum by simple definition means votes of citizens of a country to freely give practical democratic opinion or decision about their future. For instance, a referendum was conducted by the British to determine their continued membership of the European Union. The Guardian newspaper screenshot as displayed in this article, will help you understand that referendum can be conducted up to three good times. The Guardian newspaper under reference, has an article written by one Vernon Bogdanor. He gave detailed accounts of how Britain carried out her first referendum on the 23rd of June, 2016 and is yet making plans for the second attempt. 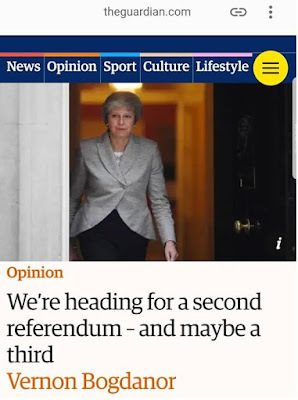 He stated in one of his articles: "we are heading for the second referendum and may be, the third". Following recent news making it's rounds globally, about the upcoming first Biafra referendum, all the concerned must galvanize effort to get the needed goal actualised. The leader of the Indigenous People of Biafra (IPOB) globally, Mazi Nnamdi Kanu who recently arrived the United Kingdom from Israel, pointedly made the announcement for the date of Biafra referendum. He has his reasons for tactically adopting a "Sit-At-Home" approach as the first attempt of the exercise. This is wisdom coded following the antecedents of the tyrannical Nigerian government. The agents of the Nigerian government are devilishly prepared to further spill the blood of innocent Biafrans who have on past occasions been tortured, maimed and killed for legitimately expressing their rights to freedom, peaceful protests and rallies. To avert such despicable scenarios, the IPOB leadership had to announce a total boycott of the upcoming Nigeria presidential election through the observance of a "Sit-At-Home". This in my view, is the first referendum of Biafrans for the world to see the readiness to exit Nigeria albeit peacefully. * One hundred percent resource control. This means that each State within Biafraland, will exclusively manage what it has and only pays the central government, specified taxation and not the other way round like what obtains in Nigeria, where a privileged few live in frivolities at the detriment of disadvantaged majority. It is however, better to be late than be the late. It will be very bad and evil for any Biafran to mortgage his/her future and that of upcoming generations by selling his/her vote for shameful two thousand naira (N2,000), to this bunch of criminal elements clamouring for Nigerian leadership. They will turn around to kill you someday with hunger as they assume power. They will arrest you, torture you and throw you into prison for daring to open your mouth to speak against their evils. It is encouraging to see the Governor of Rivers State, Nyesom Wike, recently and courageously speaking out publicly about the need to get Nigeria divided in the light of the foregoing. The leadership of the Indigenous People of Biafra (IPOB) worldwide, has clearly made it open that the more you come out to vote in Nigeria elections, the more enslaved you become to the Hausa-Fulanis. Atiku Abubakar and Muhammadu Buhari "Jubril Aminu Al-Sudani", are all the same with one overriding agenda. Looking at the next eight years of hunger and impoverishment after casting your votes for them and taking their two thousand naira (N2,000), amount to being dead already. Join the IPOB come Saturday 16th February 2019, being our first referendum date to show the world that we are fed up with the expired amalgamation of Fredrick Lugard. Join the IPOB to show the world that the killing of our people by Fulani killer herdsmen is enough. Join the IPOB on the referendum exercise to prove to the world that we are tired of our students staying at home due to lecturers' incessant industrial actions. Nigeria is a fraud and will so remain until she totally dismembers. DEAR BIAFRANS , I AM THINKING THE BEST WAY TO IDENTIFYING THE ENEMIES OF BIAFRA WITHIN IS TO CAREFULLY WATCH OUT FOR TOWNS,CITIES AND THE INDIGENOUS PEOPLE WHO WILL VIOLATE THE IPOB INSTRUCTIONS COME FEBRUARY 16. URS BIAFRAN RABBI.